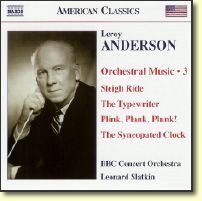 Leroy Anderson wrote and scored the majority of his compositions for full orchestra. For example: Sleigh Ride, Blue Tango, Serenata, Piano Concerto in C, etc. Soon after publishing the original orchestral composition, Leroy Anderson would transcribe each composition for either concert band (wind band), string ensemble, piano or for some other instrumentation. 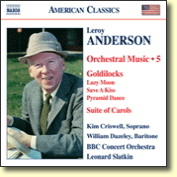 Leroy Anderson also arranged music written by other composers. For example: A Christmas Festval, Irish Suite, Song of Jupiter, Seventy-Six Trombones, etc..
To purchase any of the hundreds of Leroy Anderson sheet music for band, orchestra or other ensembles please visit Sheet Music Plus. 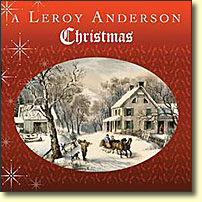 Christmas Festival, A (1950) (original work is 9:00 long, Anderson created a shorter work (5:45) in 1952. Leroy Anderson conducting 47 of his compositions from recordings that were originally released on Decca LPs from 1953 to 1962. Leroy Anderson conducting 00 of his compositions from recordings that were originally released on Decca LPs from 1953 to 1962. 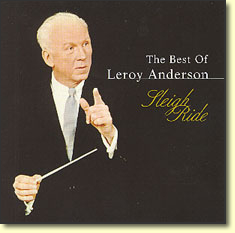 Leonard Slatkin conducts the BBC Concert Orchestra in Leroy Anderson's Sleigh Ride, A Christmas Festival, The Suite of Carols for String Orchestra, The Suite of Carols for Brass Choir, The Suite of Carols for Woodwind Ensemble and 6 other works. 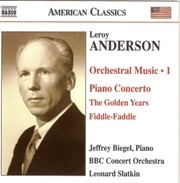 Leonard Slatkin conducts the BBC Concert Orchestra in 16 Leroy Anderson works including the Concerto in C for Piano and Orchestra with Jeffrey Biegel, pianist. 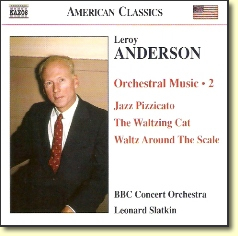 Leonard Slatkin conducts the BBC Concert Orchestra in 16 Leroy Anderson works including Forgotten Dreams, The Waltzing Cat, Song of the Bells and the Suite of Carols for String Orchestra. Leonard Slatkin conducts the BBC Concert Orchestra in 18 Leroy Anderson works including The Typewriter, Serenata, The Syncopated Clock, Suite of Carols for Brass Choir and arrangements of George Gershwin and Meredith Willson. Leonard Slatkin conducts the BBC Concert Orchestra in 19 Leroy Anderson works including the Suite of Carols for Woodwind Ensemble and symphonic arrangements from his musical "Goldilocks" 3 of which with Kim Criswell, soprano and William Dazeley, baritone. 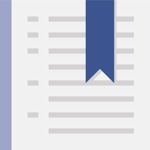 This section gives short descriptions and audio samples of 54 of Leroy Anderson's compositions. 1962 - A simple lyrical melody combined with a chromatic repeating counter melody. 1954 - This familiar folk melody takes on new freshness through the use of tonal color, and humor in Anderson's remarkable arranging skills. 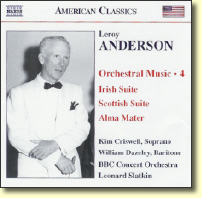 1946 - A traditional American dance tune developed into a brilliant concert piece with touches of humor and unexpected rhythmical variations which are hallmarks of Anderson's musical style. 1962 - A brilliant showpiece for four clarinets in the spirit of Bugler's Holiday. 1947 - Anderson first chose the title and then wrote for strings a modern "perpetual motion" piece. 1953 - A lovely, languorous melody in tango rhythm. 1959 - Based on a charming ballet sequence in the show. 1962 - Anderson's version of the maxixe, an ancestor of the samba, and popular around 1912. 1947 - Evokes the carousing and rioting of the young bloods of Mallow. 1949 - A haunting song with an ingenious contrapuntal effect near the end. 1970 - Posthumously published, this features timpani, snare and bongo drums in a somnolent mood. 1951 - Three flutes are featured. This merry song speaks - and sings - for itself! 1951 - A nameless body of soldiers approaches from the distance to the sound of trumpets. As they draw nearer the music grows louder and louder, and finally they march away into the distance. Plink, Plank, Plunk! 1945 - Contrasts a brisk walking theme, first heard on solo trumpet, with a flowing middle theme carried by the strings. 1947 - The melodic and harmonic material shift in texture, key and mode, as an infectious Latin rhythm is played throughout. This has entered the jazz repertoire, being adapted by both vocalists and instrumentalists. 1951 - The middle section of this waltz contains something rarely heard: a duet between chimes and bells. The flowing musical themes show why Anderson has been called one of our greatest melodists. 1955 - Selections: Angels in Our Fields; O Sanctissima; O Come, O Come Emmanuel; O Come Little Children: Coventry Carol; Patapan. 1945 - Leroy Anderson's only work written for concert band. 1950 - Anderson has described an imaginary animal that might be the brother of Puss in Boots. Like a stately cavalier, this feline gentleman dances to a graceful melody constructed on the strings playing the meowing of a cat.